David Sheldrick is a legendary figure in wildlife conservation, he founded what today is the largest national park in Kenya, Tsavo. He was the first warden of the Eastern Sector which stretched over 5,000 square miles. His dedication to helping wildlife lasted until the end of his life. 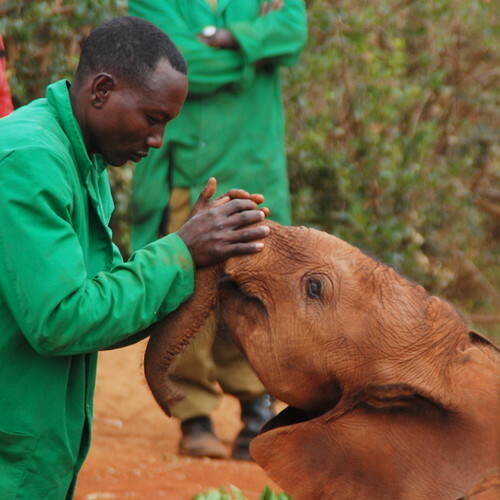 He was a remarkable man with many achievements, he was the first person to ever hand-rear orphaned elephants. He was a man of great integrity and therefore, a trust has been formed in his name to have his legacy live on. The trust supports the Tsavo National Park and cares for orphaned animals that have lost their parents to devastating events such as poaching. The trust raises them, keeps them from harm and re-introduces them into the wild where they belong. The Sheldrick Wildlife’s support stretches far and wide, they have spoken out about the ivory ban, put in place anti-poaching and de-snaring operations, as well as mobile veterinary projects. Their help gives hope to the war on wildlife. This entry was posted on June 9, 2010 at 7:18 pm and is filed under Africa: Elephants, Organization of The Day with tags Africa, Anti Poaching, Conservation, David Sheldrick Wildlife Trust, Elephants, Ivory, poaching, Rhinos, stop poaching, Tsavo National Park, Veterinary, wildlife. You can follow any responses to this entry through the RSS 2.0 feed. You can leave a response, or trackback from your own site. They need all the support and help possible to prevent further poaching, snaring and loss of elephant populations in Kenya and the borders. So many wonderful successful stories from the rescue and raising and then release of the elephants and rhinos. A delight to visit and support them. Such inspiration for the rest of us! Thank you for having such perseverance. Thank you for making the world a better place.